We caught up with our friend and Kicks Back recipient Cyndi G. to talk about how she started running, how she manages her training, and how she navigates her CF life. Check it out! I started running in the summer of 2012. I had started exercising that year by walking and taking Zumba classes, and then I realized that running would be a more efficient work out. I started out by just trying to run to the end of the street. Then I slowly added more running distance in with walking in between. By the fall of 2012, I ran in my first 5K where I was able to run the entire way and I was so proud! After running in 5Ks for a few years, I wanted a new challenge. So in the spring of 2015, I trained for my first half marathon. At the end of the race, I was so amazed that I could run 13.1 miles! I was hooked on running! I have stayed very active since finishing my first half marathon and have now completed a 10 mile race, a sprint triathlon, and 3 additional half marathons. I plan to train for my 5th half marathon this spring. 2. What is your current training schedule? How do you balance training with daily life? I now train for a half marathon every spring and fall, and try to do other forms of exercise in between (like swimming and cycling). When I am training for a half marathon, I run 4 times per week. I wake up early during the week and run before my husband and kids are awake and before I have to go to work. On the weekends, I do my long runs on Saturday mornings with a running group. I never exactly want to jump out of bed to go for a run (particularly when it is dark or cold outside). But I have found that if it get my run done first thing in the morning, I am always glad that I did it and work/life do not get in the way. 3. 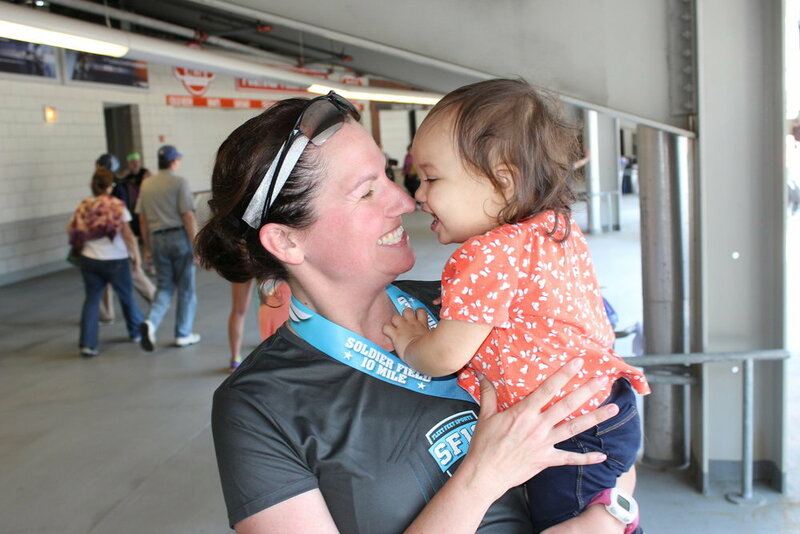 What is your favorite race you have run? 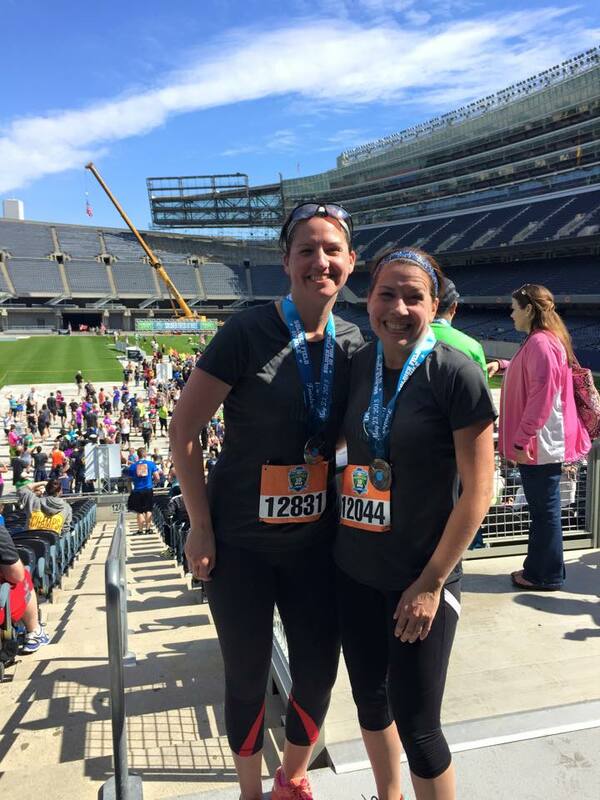 I ran the Soldier Field 10 Mile race in Chicago with my sister, Laura, who also has CF. The weather was perfect, it is a very well organized race, and the course includes an awesome view of the Chicago skyline and finishing on the football stadium field. But the best part of that race experience was running it with my sister! I was so proud of both of us when we finished. 4. What is your favorite part about running? I have never felt better since I became a runner. I feel strong. I have also made some good friends from joining a running group. And races are fun! 5. What is your favorite post race treat? The Taco Bell Bacon Grande Scrambler Breakfast Burrito! It is delicious! 6. Any advice for current or future runners out there, especially CF runners? Start with a small goal (walking, running down the street, building up to running a 5K, etc.) and then just keep at it. A lot of days will feel rough, but then all of a sudden you will notice how much you have improved over time. And try to find a running group. I found one through my local Fleet Feet store. Training for a half marathon and long runs are so much better with a group to support you along the way! There are pace groups for everyone, from fast runners, to slower runners, to interval runners, to walkers, so you do not need to feel intimidated about joining. Finally, know that you can do so much more than you think you can. I was never a runner growing up and could not imagine running 1 mile, let alone 13.1 miles, when I started running. But if you stay determined, you can do it too!